The logistic map is a discrete recursive mathematical function that maps the output of one iteration of the function onto the input of the next. Thus the logistic map is a simple mathematical way of examining the effects of feedback on population growth. Moreover, the logistic map is also a good mathematical representation of any type of driven-damped system that incorporates both positive and negative feedback; however the current understanding of what is positive feedback and what is negative feedback is flawed. The logistic map models population growth & decline as a “Driven Damped System”. The variable (x) is a percentage measure of the population size and thus can only have values between 0 (i.e. 0% – extinction) and 1 (i.e. 100% – maximum possible population). R is the “Driving Parameter”. When R is greater than 1, R drives the population (x) constantly higher; but as it does so the “Damping Term” (1-x) becomes smaller and smaller and in doing so gradually becomes a counterbalance to the driving force of R. This is the mathematical feedback in action; the systems own growth eventually acts to dampen any further growth, and in so doing the population is expected to stabilize to an equilibrium level. So what is it about this simple equation that causes mathematical chaos to emerge? The logistic map is a naturally damping system; because if left undriven (i.e. if R=1) whatever population initially exists will eventually fall to zero. To stop this inevitable fall to extinction the system needs to be constantly driven; however it appears that if we “overdrive” the system positive feedback will begin to dominate its behavior and cause the eventual emergence of chaos. The log map is correctly thought of a model of a driven damped system with feedback; but it also acts as a model of completing forces whose mutual interaction serves to balance and stabilize the system, by gradually reducing internal adjustments and thereby self-tuning its own way to equilibrium. In the self-stabilizing behavior of the log map, the recursive mathematics acts to find its own internal balance of the driving and damping forces. The action to find the exact balancing point however requires that any back and forth coarse movements about equilibrium be gradually reduced so that the system can ultimately fine-tunes its way to equilibrium. The log map finds equilibrium when the variable damping force eventually manages to synchronize its balance with the fixed driving force – in other words when the variable (1-xnow) manages to synchronize with R so that the two have become inversely balanced and consequently R(1-xnow) = 1. When this happens, (xnext) has become equal to (xnow multiplied by 1), so there is no further adjustment and consequently the system rests at a stable equilibrium. Or, at least, that is what it is meant to do! As it turns out, the log map actually only stabilizes when the driving is low! We find that as we increase the driving parameter R, stabilization to equilibrium becomes gradually more difficult; gradually becoming ever more unstable until eventually chaos emerges. However, contrary to popular belief, increasing the driving force is “Not” what is causing the instability to emerge – the value of R actually plays another role that has always been overlooked! Mathematically the parameter (R) “plays a dual role” in determining the behavior of the system. (R) not only determines the driving force, but it also determines the “incremental step-size” of both the driving and damping forces. It is this (overlooked) incremental step-size which determines the system’s mathematical ability to internally fine-tune a self-stabilizing equilibrium. If the system is unable to sufficiently reduce the coarseness of internal adjustment, then it will ultimately be unable to find the exact balancing point (of the driving and damping forces), and as a result it will end up oscillating about the unobtainable/unachievable equilibrium. So although the log map does indeed model feedback (in that the system’s own growth does indeed act to stem further growth); the chaos that emerges however, does not result from “excessive positive feedback”, but rather from the systems inability to synchronize the variable damping force to the fixed driving force. So just to clarify; to really understand what is going on here we need to be very clear that in the logistic map we are in fact dealing with two types of damping. Firstly we have a term (1-x), which acts to damp the size of population. And secondly we have a self-balancing, self-synchronizing process, which acts to damp the population’s volatility about its potential equilibrium population size. In this second type of damping (the damping not of population size, but of population volatility), the synchronization of the variable damping term (1-x) to the fixed driving term (R) can only occur if the incremental step-size can be reduced small enough to fine-tune its way to its counterbalancing equilibrium (i.e. to the point where R(1-x) = 1). Any driven damped system will only be able to self-stabilize (i.e. self-organize its own balancing stability) if it has the ability to “fine-tune” its way to equilibrium. With this concept of incremental step-size (and its degree of fine-graininess or coarse-graininess) in mind we now in a position to explain the increasing instability that occurs with increasing value of R.
When R is between the values of 1 and 2 the system will evolve smoothly and directly (i.e. straight) to equilibrium. The lower the value of R, the smaller is the size of the incremental steps, and consequently the greater is the number of steps required on the path to equilibrium. Conversely the higher the value of R, the larger the step-size, and consequently the faster the self-balancing mathematics will achieve equilibrium. When R=2, the system is effectively “critically driven” (meaning it achieves equilibrium in the fastest possible time, without overshooting)! The coarser step-size of driving parameter R, has translated into a coarser step-size for (1-x) making it more difficult for the damping variable to hone-in on the exact counter-balancing inverse of R.
As we further increase the value of R we are not only increasing the driving force but also the incremental step-size. In so doing, the transition down from coarse-tuning to fine tuning takes longer, and so it therefore takes longer for this back and forth autofocus process (this mathematical auto-convergence) to achieve equilibrium. Thus coarse-tuning prolongs the damping out of volatility, and thus prolongs the damping down to equilibrium. At R =3 the system is on the border of convergence and divergence. Beyond R=3 the driven and damped forces can no longer synchronize their internal dance and fine-tune to a single equilibrium. This inability to converge on a single point of equilibrium causes the system to bifurcate self-stabilization into a 2 step process. On the surface this bifurcation can appear to be the “emergence of divergence”, but it is in reality simply a “less fine-tuned convergence” caused by coarse internal synchronization. This 2-step process is referred to as a “period-2 oscillation” and is considered stable and non-chaotic. While, this is obviously true, its emergence has nonetheless produced a “sensitivity” in the system’s future behavior which is dependence on the system’s initial conditions. For although the system cannot find the single true equilibrium, this unachievable equilibrium nevertheless still exists, only now it behaves as a “Tipping Point”! At first glance it might appear that the equilibrium has simply become a point about which the system oscillates. However, a little analysis reveals that the existence of this unobtainable equilibrium means that there are now 2 different path trajectories which the system can take. Depending on which side of the hidden equilibrium the system evolves to, determines which path trajectory the system will take. So the inability to obtain a single true equilibrium means, the behavior of the system has become sensitive to the emergence of a tipping point; and given any 2 initial conditions we will find that their future evolutions are either in “phase with each other”, or “out of phase with each other”. This is interesting because it means that the system now has 2 different paths that it can potentially gravitate to. Furthermore, different initial conditions of the system have to choose, between these 2 different (but equally likely) trajectories; and this type of highly sensitive tipping point choice is indicative of the type of behavior of a ubiquitous physical process known as “spontaneous symmetry breaking”! Period 2 oscillation is an oscillation between, overdamping the population, and underdamping the population; and the coarseness of R determines the separation between each leg of this oscillation. As R increases, the separation also increases to accommodate the increased step-size. Gradually however the system begins to experience difficulty synchronizing this 2-step equilibrium. When the system breaches R=3.236, it begins to overshoot on each leg of the oscillation and so once again has to constantly tweak its behavior in order to fine-tune its way to stability (i.e. fine-tune its way to its period 2 equilibrium). By the time the R reaches R=3.445 the system is now taking an infinite amount of time to fine-tune its way to its 2-step equilibrium. Beyond R=3.445 the system must, once more, bifurcate in order to stabilize; and so the 2-step stabilization process becomes a 4-step stabilization process, which is generally known as a “period-4 oscillation”. As before, though unobtainable, each leg of the 2-step equilibrium still exists, only now each behaves as a new tipping point. The system behavior is now sensitive to 3 internal tipping points, and once again although at first glance all period-4 oscillations might look the same, there are in fact 4 possible trajectories. Further increases in R bring increasingly faster period doubling ultimately leading to an infinite period oscillation and with it an infinite number of tipping points; any one of which can affect the systems future evolution. However despite the fact that sensitivity emerged from the very first bifurcation, it is only after this infinite number of tipping points has emerged, that the system’s behavior is commonly described as being “Sensitive Dependent on Initial Conditions”(SDIC). SDIC is commonly perceived as the so-called “signature of chaos”; but in the logistic map, sensitivity to initial conditions occurs in period 2 oscillations, period 4 oscillations, period 8 oscillations, etc, so SDIC is not unique to chaotic behavior. What is unique to Chaos is the lack of any obvious repeating pattern, and the emergence of unpredictable symmetry-breaking behavior. The emergence of Chaos is the emergence of system-wide “skew”! So excessive coarse damping of volatility brings about the emergence of symmetry-breaking skew; but ultimately it can bring about the emergence of, not only skew but, “All the Higher Moments” in a probability distribution of behavior. 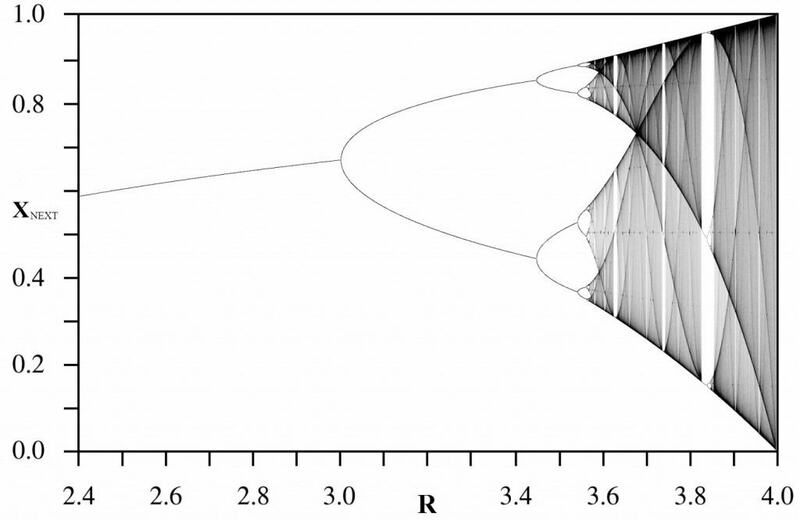 So Chaos in the Logistic Map, it turns out, is actually a form of Coarse Damping to Equilibrium – Chaos is Coarse Synchronicity! Chaos appears to be the universe’s search algorithm; a mathematical driven way of non-randomly exploring infinite possibilities, and higher dimensionality! Too long has the Science of Chaos focused on the idea of SDIC. Chaos is more than unpredictability. Yes, chaos is indeed unpredictable but not because of SDIC, but because of the emergence of the infinite number of evolutionary paths, and their associated non-conforming, creative asymmetry behavior. What’s interesting about studying chaos is not the unpredictability behavior, but the surprising and highly creative emergent behavior that can result from the coarse synchronization of internal dynamics! In summary, the behavior of the logistic map is a study of the coarse mathematics that drives The Emergent of Creative Diversity.